Stephane Wrembel will be joining us as a special guest teacher on the last full day of Django Camp this year—Saturday the 16th. He has been here as a teacher and concert headliner many times, so I’ve written and re-written his profile almost as many. Here’s what I wrote last year, when Stephane was here with his old friends Emmanuel Kassimo and Serge Krief. 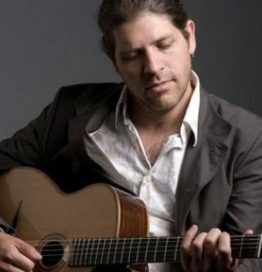 Since those early days of the current Gypsy jazz renaissance, Stephane has been a precious resource and inspiration to many of us with an interest in the style. He has been on our staff and stage many times over the years. Here’s a clip from one of his earliest performance at Django in June, in 2006, back when our concerts were held in Helen Hills Hills Chapel. Joining Stephane were David Langlois on washboard kit and Jared Engel on upright bass. Any year is a good year to have Stephane Wrembel back. But 2017 offers us a special opportunity because of the presence of both Emmanuel Kassimo and Serge Krief. Stephane and Emmanuel learned to play jazz manouche together as teens in and around Fontainbleau, France, where they jammed for countless hours as only obsessive teens can. Their primary teacher lo these many lunes ago—none other than Serge Krief. This, friends, is a reunion you do not want to miss.